Hey, guys! 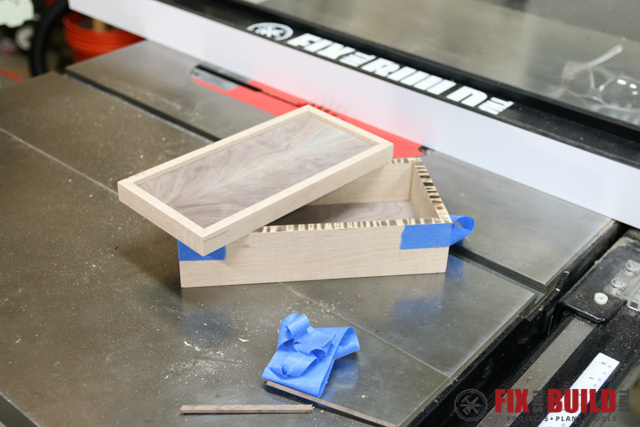 Today I’m going to show you how to make a jewelry box with free plans for beginners. I’ve had a lot of requests over on Instagram and Facebook for me to show how to make a small keepsake or jewelry box. The great thing about boxes is that you can make them many different ways and for a ton of different purposes. 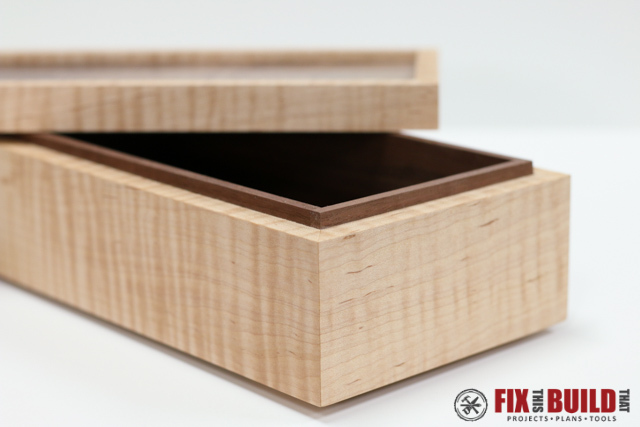 Jewelry box, keepsake box, men’s valet, photo box, gift box…you name it and you can use these same methods to make a box for whatever your little hear desires. This project is sponsored by the great folks over at SuperMax Tools and I’m going to be using my SuperMax 19-38 to do a lot of the stock preparation for this project. 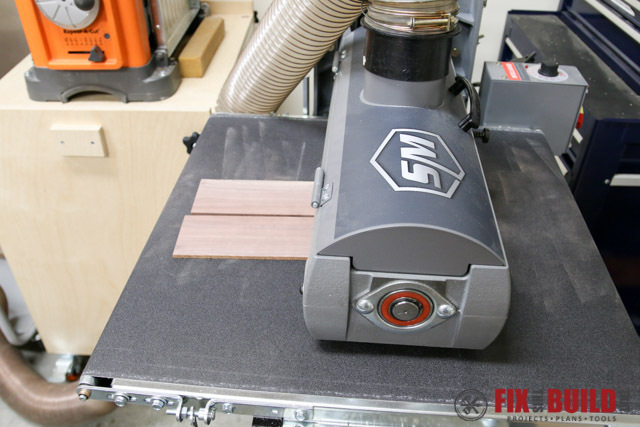 The drum sander is going to allow me to make custom sized stock without tearout in heavily figured wood. I’ll also be doing some bookmatching for the top…and no, that’s not pairing up all my Dr. Seuss books. 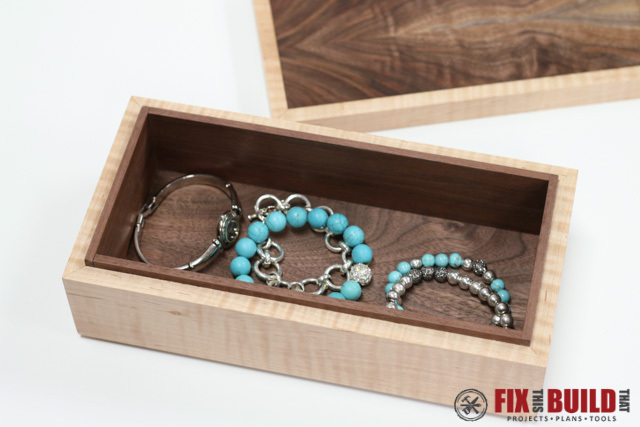 Since the top is a friction fit, you don’t need any special hardware for the jewelry box. 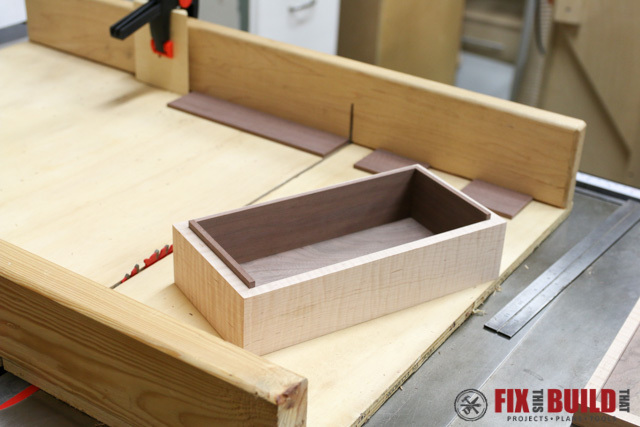 This is a great way to try out box making and you can add hinges, locks, drawers, trays, etc. as you progress in your skills. This is actually only my second try at a wooden jewelry box, so you can see it’s not hard to do! 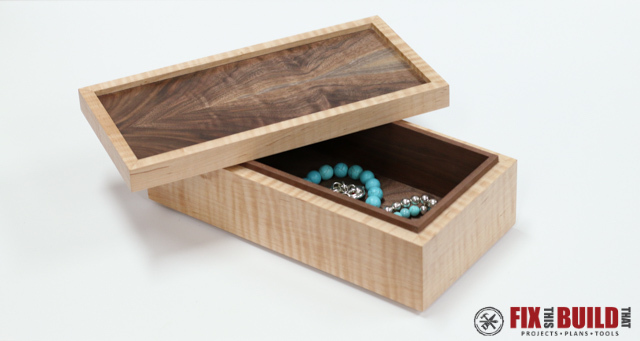 I made the wooden jewelry box 10″ x 5″ and 3″ high. I like the 2:1 ratio look on the box and this size seems to be just big enough to be substantial, but not too big. You can easily adjust the size to any dimensions you’d like and use these same methods. 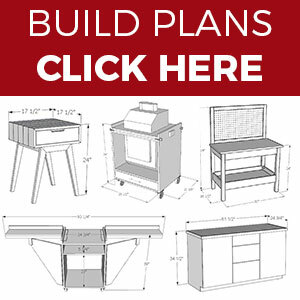 I also have jewelry box plans for beginners above so make sure to check those out. The best part is this build takes very little wood. So you can buy nice hardwoods for the box and not break the bank. I had this piece of curly maple with amazing figure I’ve been looking to use. So I cut material for two boxes which you will see some parts for both boxes in the pictures. 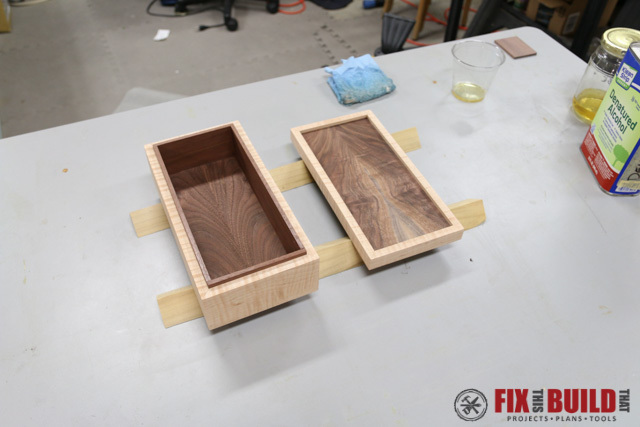 I used the maple for the sides of the box and walnut for the top, bottom, and lining for a nice contrast. Firstly you’ll make the top and bottom panels. 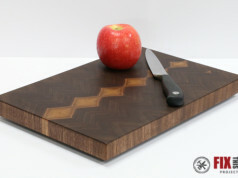 I used a larger piece of walnut with some nice figure to make my tops and bottom panels. 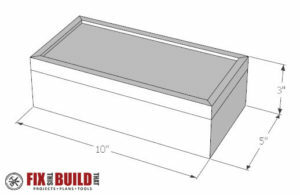 If you are just using a solid one piece panel or 1/4″ plywood this will be very easy. 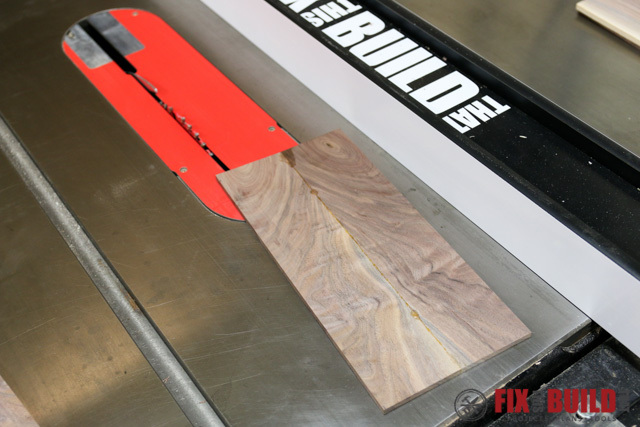 I resawed the walnut into 2 pieces on the bandsaw then cut those in half to finish with 4 pieces. Next I put them through the 19-38 drum sander to get down to a final dimension of 1/4″. 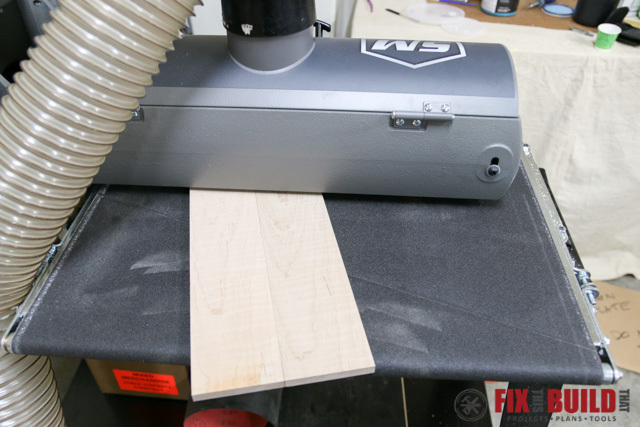 This is one of the best uses for the drum sander in my book. It’s easy to get right down to a specific dimension quickly. After they were flat I glued the pieces together into 2 panels and then cut them to size. 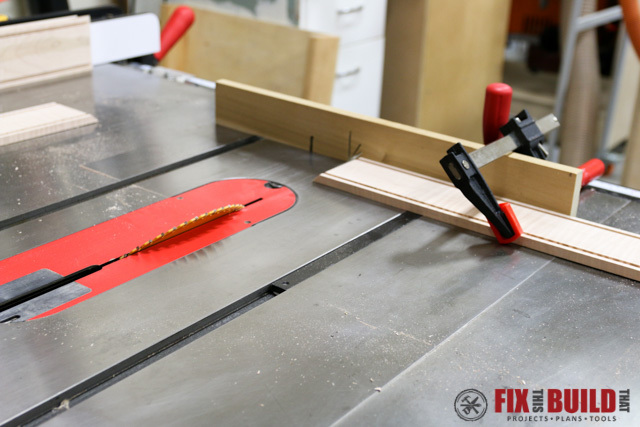 If you aren’t using resawn lumber or glue ups, cut your top panel and bottom panel for your wooden jewelry box to 9-1/2″ by 4-1/2″. 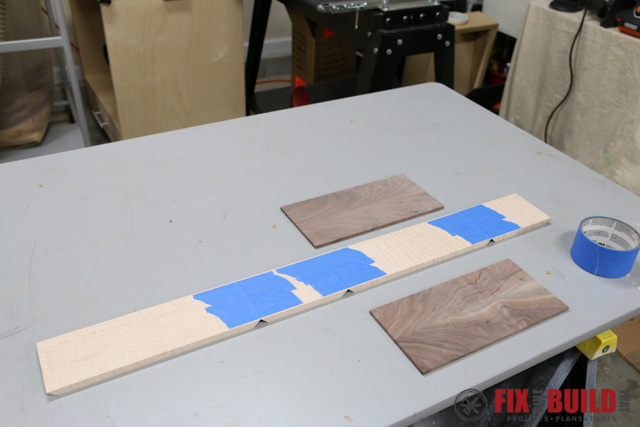 For the sides, cut your pieces into 3-1/8″ wide strips. You’ll need two 10″ piece and two 5″ pieces. I cut mine to 16″ long to be split in two next. 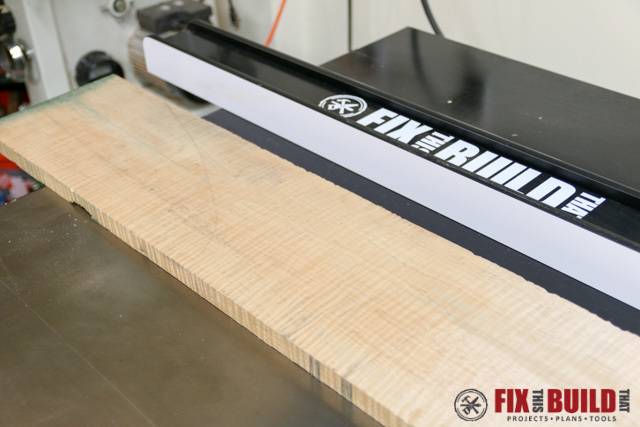 I resawed the pieces on the bandsaw to get two pieces 16″ long and just under 1/2″ then took them to the drum sander and brought them down to 3/8″ in thickness. 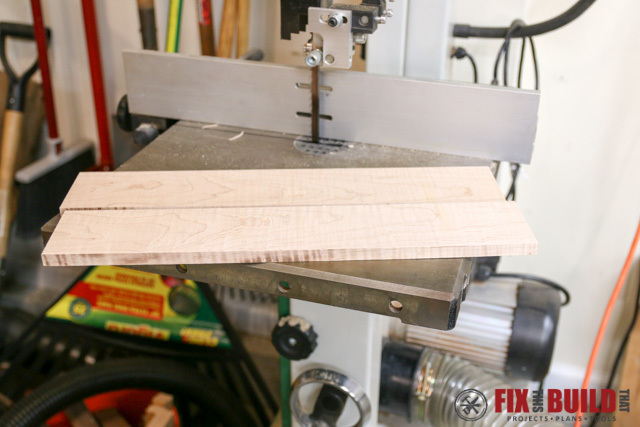 Next, cut the grooves in the sides of the DIY jewelry box for the top and bottom panels. 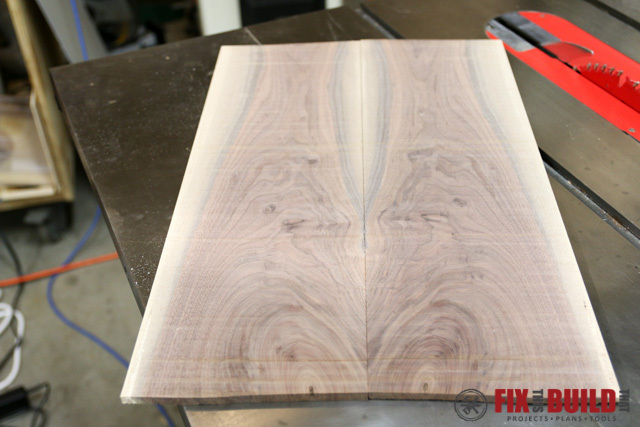 The grooves are 1/4″ wide and 3/16″ deep. They are located 3/16″ from the top and bottom. 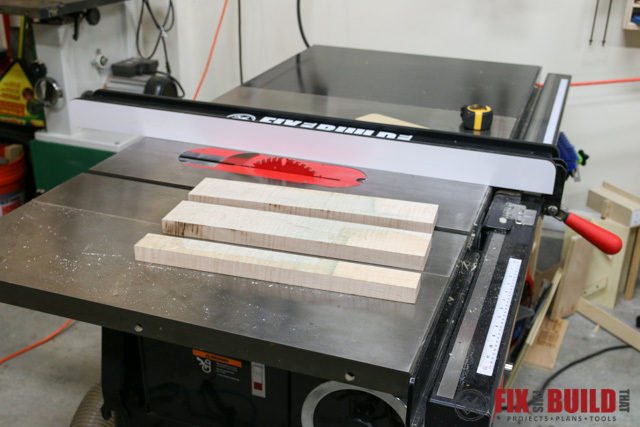 Do some test cuts in scrap before making the grooves to be sure your top and bottom panels fit snugly. 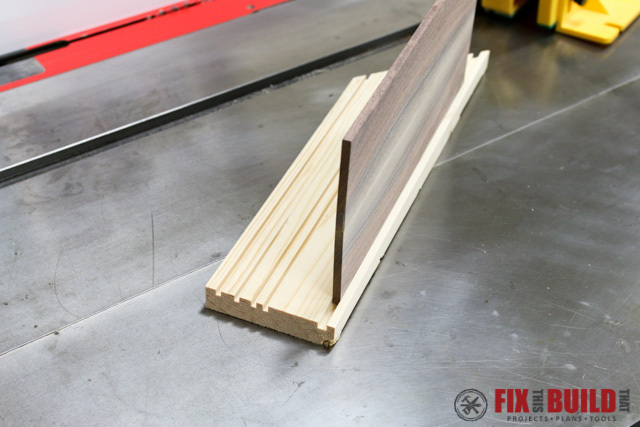 Cut the sides to length, 5″ and 10″, with miters on each end. 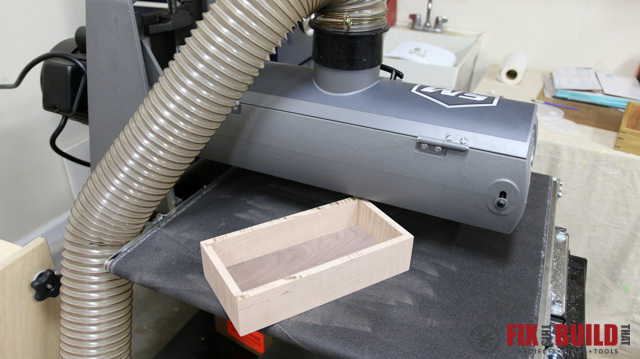 By cutting the sides from the same piece you can achieve a continuous grain flow around the whole box. 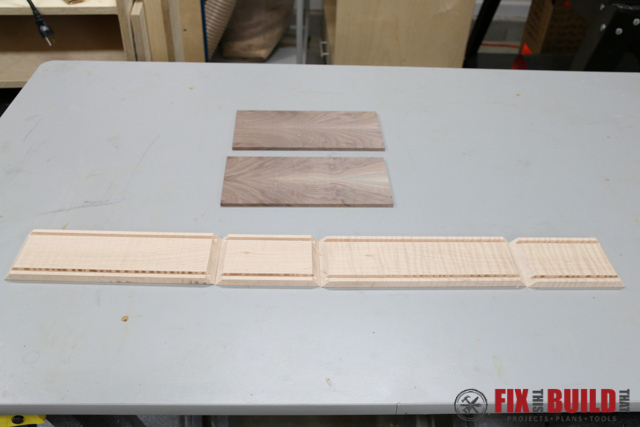 Assemble the jewelry box by laying the side pieces end to end in a straight line and taping the joints on the outside. 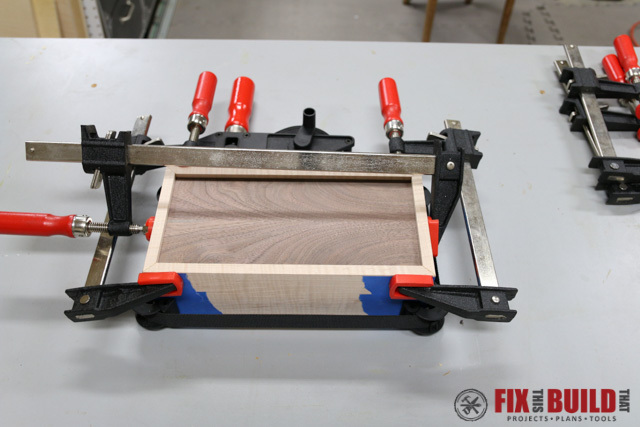 Apply glue to the miters and then “fold up” the box, inserting the top and bottom panels into the grooves. Clamping the glue up with a web clamp makes this much easier, but f-clamps work well also. After the box is dry sand the sides to 220 grit before the next step. Yes, I realize this a wooden box with no way to get inside…patience my friend. Now you’ll make the top (ah ha!). 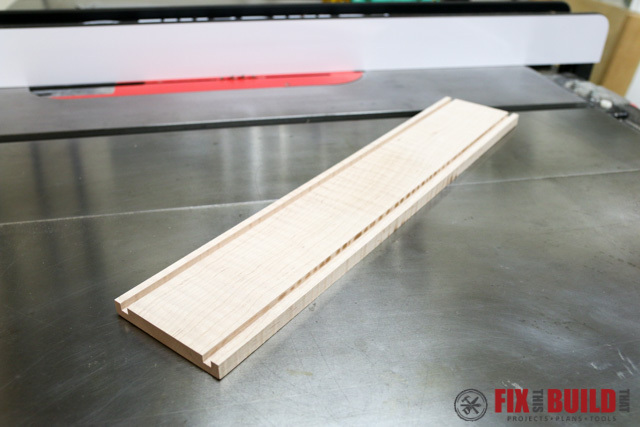 Cut through the jewelry box 3/4″ down from the top on all 4 sides. 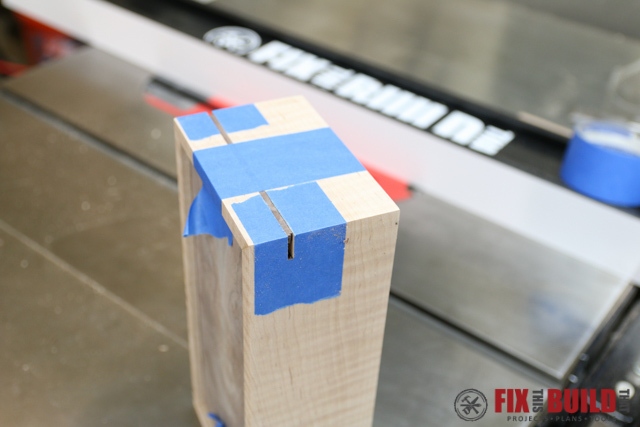 To do this safely, cut the short ends first and then tape in some 1/8″ shims in the kerfs to hold the wooden box together while you cut the long sides. 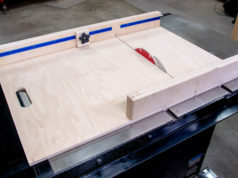 This is the method for doing it on a tablesaw, you can also do this on a bandsaw, you’ll just have a little more clean up. I got burning on the top edge of the jewelry box, so I took it to the drum sander to remove the burn marks and get everything level. I also did this to the underside of the top. Feeding the box in on an angle helps reduce your chances of snipe. 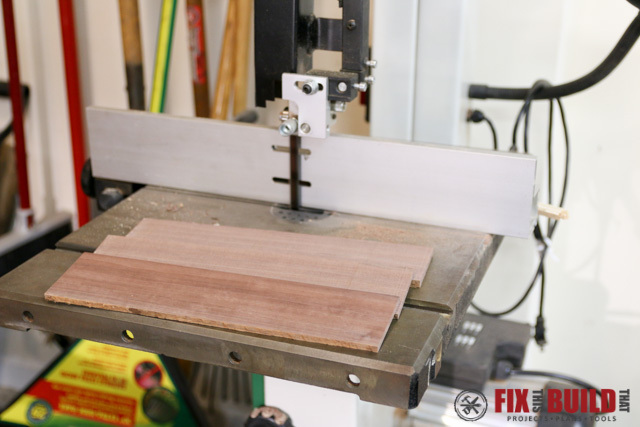 You can also flatten the parts on a sheet of sandpaper stuck to your tablesaw. The last piece of the jewelry box is the lining which serves as decoration as well a lip for the lid. 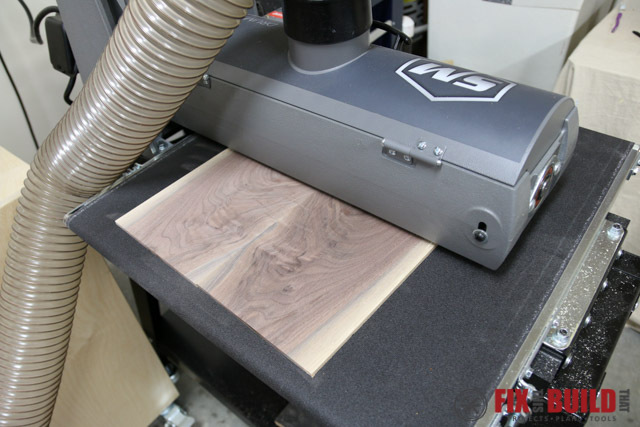 I resawed some walnut to 1/4″ on the bandsaw and sanded it flat to 3/16″ on the drum sander. Rip the pieces to 2″ wide and then cut the pieces to fit in the box. 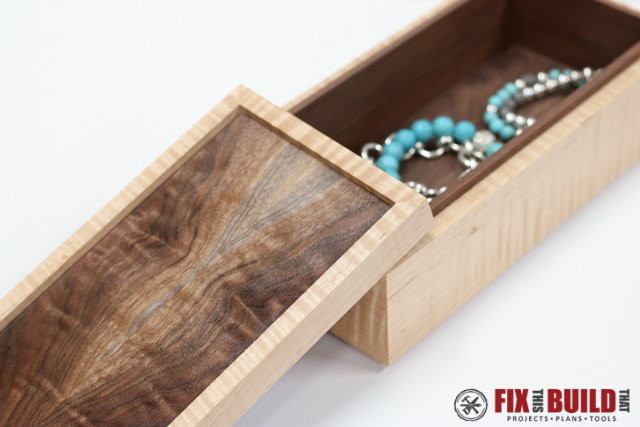 The short pieces should be ~ 4-1/4″ and the long pieces should be ~8-7/8″, cut the pieces to fit your wooden jewelry box. 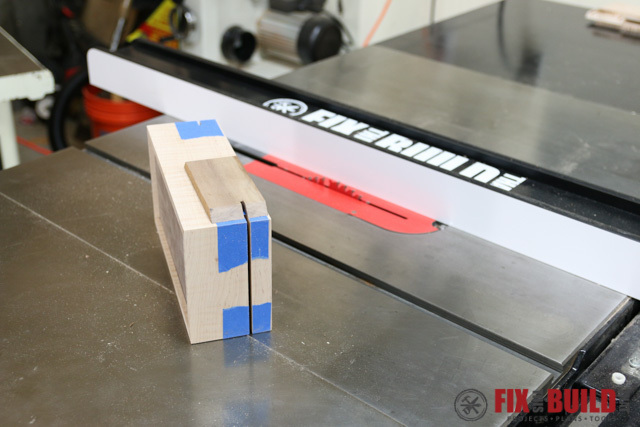 You can miter these corners as well, but stacking miters inside miters is a bit more tricky. 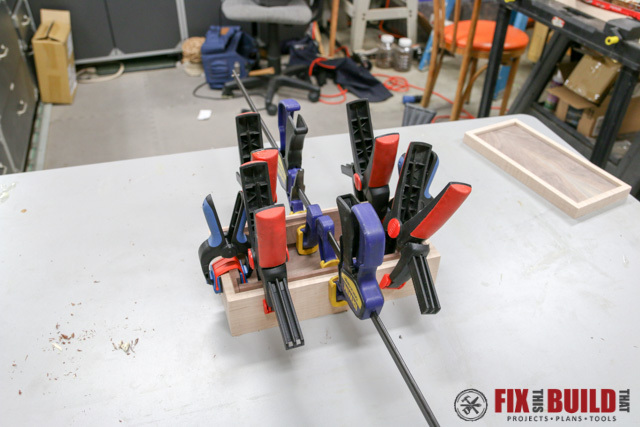 Glue the pieces in place and clamp with some spring clamps. Put the short pieces in first and sand everything to 220 grit before installing. 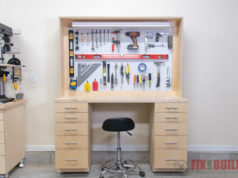 After the glue has dried, touch up any sharp edges and do a once over of the whole jewelry box with 220 grit sandpaper. Now apply your finish of choice. I used shellac to really pop the grain of the maple but not yellow it. I applied 4 coats and finished it with a beeswax mixture. 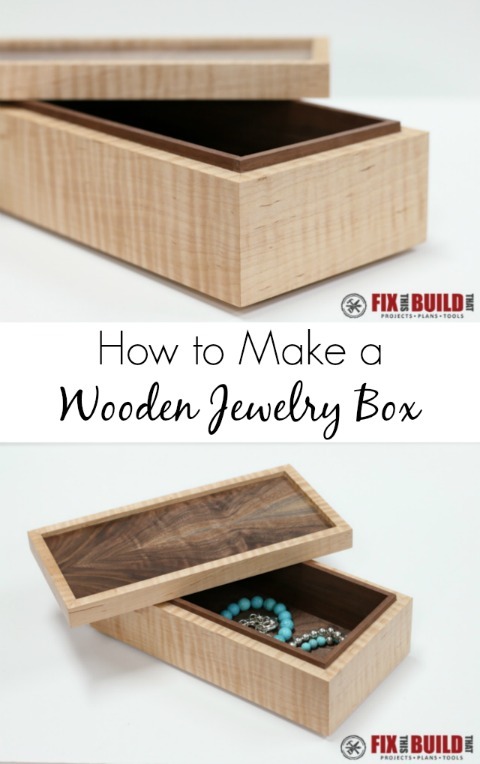 Even though I used some fancy wood, this simple DIY wooden jewelry box build is easy to make and a great way to get started in box making. You can do so many more things with boxes, like splines, hinges, trays, etc. Don’t forget to get the jewelry box plans below! I’ll be doing some future projects where I show you some of these techniques, but until then go check out some other projects on my Projects Page. SuperMax Tools provided me with product and/or monetary compensation as a sponsor of this build.